Peter Malcolm Green is a legend in the UWA Cricket Club, because of his longevity as a player and his commitment and contribution to the club, both behind the scenes and in the spotlight. Peter Malcolm Green is a legend in the UWA Cricket Club, because of his longevity as a player and his commitment and contribution to the club, both behind the scenes and in the spotlight. He has been with the club since 1975-76, when he started playing as an undergraduate, and holds the club record for the number of WACA matches across all grades, playing regularly until 2005/06 – a 30 year span –altogether around 400 games in the UCC/UWACC cap, with most of these games running over two days In 1977-78 he won the club’s Le Couteur Medal for the Champion Cricketer of that season. He was made a Life Member of the UWACC in 1992 and in 1995 was granted the award of Club Letter at the 75th Anniversary of Sports Council Blues Awards presentation dinner. Peter played 24 First Grade matches from 1978-79 to 1985-86, a tally that would have been higher had teaching not taken him to the country, so most of his matches have been in the lower grades. He was an important member of the Fourth Grade premiership side of 2002-03. His last WACA match was in 2010-11, so his playing career with the club spanned 35 years. He was a fine leg-spin bowler, a useful batsman and an absolutely brilliant fieldsman, especially in the covers. He has also made many appearances for the UWACC Veterans cricket team, including a tour of England in 2008. He was a Committee member for around 20 years, held key administrative positions, including Vice-President, Secretary and Treasurer and for many years was the Chairman of Selectors. Peter has represented UCC on the WACA District Cricket Council, the Guild Sport and Recreation Council, has been Cricket Co-Ordinator for School Sport WA , President of the WACA Schools Cricket Council , and a member of the WACA Game Development Committee. Peter has attended and participated in the Nets for something approaching 1000 training sessions. He supported the club’s movement to the Irwin St Building, helped the Club survive by taking the WACA to the Supreme Court for an injunction and then winning the battle at the WACA AGM, and repeated the fight for the club a few years later. He also helped establish the UWA Foundation which has guaranteed financial security for the Club, organise the UCC Team of the 20th Century and the associated function, and is on the organising committee for the club’s Centenary Dinner. Not surprisingly he has been to the forefront in preserving the club’s history. Interestingly after 20 years he still pays the club phone bill, something of which the present committee is likely unaware. He will be back to other roles at the club when he retires from work in 3 years’ time so his UWACC story is unfinished. 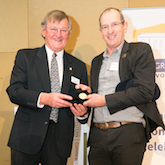 Peter Green is a very worthy recipient of a Convocation Medal for services to the University of WA, its students and graduates.